A pretty favorite, rose gold stands out and shines brightly in this 14K rose gold free-form paisley bar necklace from Apples of Gold Jewelry. The 14K rose gold pendant, which measures in at just under 1 1/8" wide by 1/4" tall, is a wavy paisley design instead of a plain bar. The chain, which attaches to the pendant, is also 14K gold. You have your choice of a 16" chain or an 18" chain. The pretty pink hued necklace is sure to become a favorite, especially if you are looking for something unique! 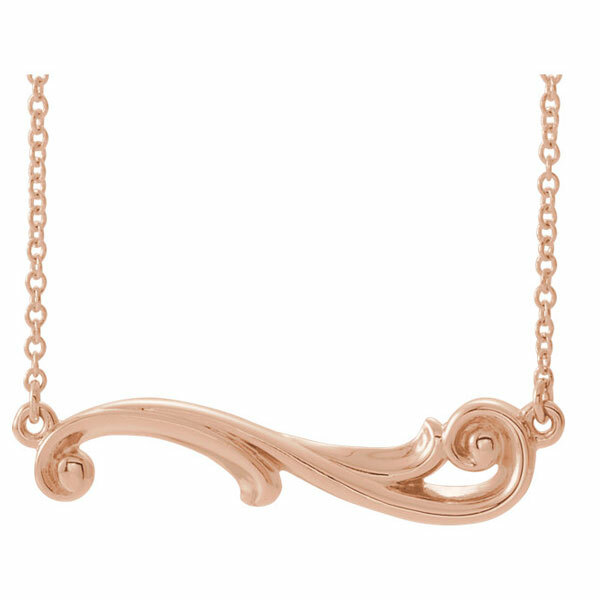 We guarantee our 14K Rose Gold Free-Form Paisley Bar Necklace to be high quality, authentic jewelry, as described above. Freeform Paisley Bar Necklace in 14K Gold, 16" or 18"